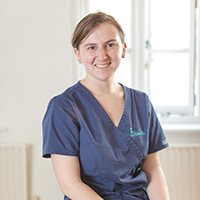 Jo is one of the trainee nurses at Boness. She began her career by volunteering at Boness as a Kennel Assistant in 2012 at the age of 17, and started her nursing training in 2015. She is studying BSc Veterinary Nursing with Applied Animal Behaviour at the College of West Anglia in Cambridge. Jo really enjoys all aspects of the nursing training, but particularly enjoys spending time with the in-patients in kennels and looking after them when they’re not feeling well. She is also interested in animal behaviour and is looking to hopefully pursue further quallifications in the future after completing her nursing training. Jo is a huge fan of guinea pigs and currently has one at home called Hawkeye, who is nearly 6.